Celtic kept up the pressure on league leaders Glasgow City ahead of their clash on Thursday with a 2-0 win over Forfar Farmington at Barrowfield. Megan Sneddon put Celtic ahead and Suzanne Grant punished a Forfar defensive error to make it 2-0. City kept up their fine domestic form with a feast of goals away to Aberdeen in a 14-1 win for the champions. 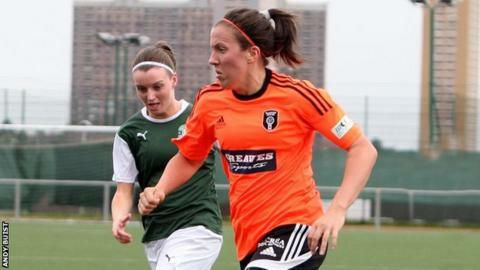 Substitute Emma Mitchell hit four for City after replacing Jane Ross, who had already scored a first-half hat-trick. Three goals for Ashley McDonald, a double from Jo Love and strikes from Christie Murray and Ciara Barnes completed the scoring. Claire Martin got the Dons' consolation. Celtic and City face each other on Thursday at Glasgow Green, with City nine points clear in the table. Hibs stay in third on goal difference after their 4-0 defeat of Spartans in the Edinburgh derby. Susan Crilly got the Hibees up and running before she added another with Caroline Weir and Kirsty McLaughlin also scoring. Rangers thrashed bottom side Kilmarnock 9-0, with second-bottom side Inverness going down 10-1 to Hamilton Accies, with Susan Fairlie netting a hat-trick for Hamilton. Hutchison Vale edged past Falkirk with a 2-1 victory thanks to a brace from Kat Smart. Falkirk replied through Cheryl Watt, but it was not enough to salvage a point as Hutchie emerged with the victory.